— more than 40 years apart. In late summer of 2011, Ryerson Pamplin sat in a campus office with a pair of advisers to discuss potential projects for her master’s thesis in forest resources. Before the first ideas were even tossed about, Ryerson noticed a map of Lake Issaqueena in Upstate South Carolina glowing on a computer screen. “What’s her name?” Cox said. “Hold on a second,” Cox said. And then he hustled out of the room, leaving Ryerson and her major adviser, Elena Mikhailova, to exchange puzzled glances. But Cox soon returned and handed Ryerson a thick booklet. 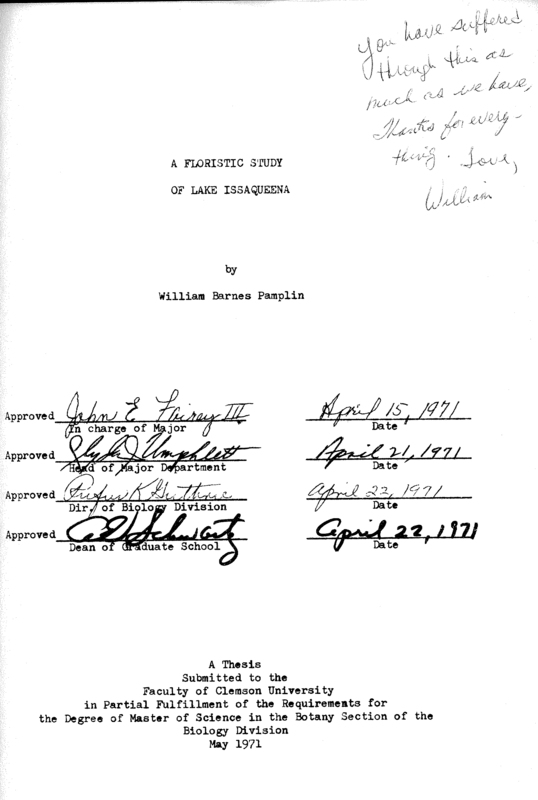 On its faded green cover, in an old-fashioned manual typewriter font, was the title “A Floristic Study of Lake Issaqueena by William Barnes Pamplin.” It was dated May 1971. “This was written by your mom?” Cox said. Now it was Mikhailova and Cox’s turn to gasp. But their surprised expressions quickly transformed to smiles. All three got it at once. “Ohhhhhhhh, this is cool,” Ryerson said. More than 40 years after William Pamplin had roamed and researched the forest surrounding Lake Issaqueena, Ryerson Pamplin would follow in her mother’s footsteps for her thesis. In the 1930s, during the depths of the Great Depression, the federal government hired hundreds of unemployed workers in South Carolina to develop what was to be called the “Lake Issaqueena Recreation Area.” Under the supervision of Clemson University’s George Aull, the laborers built roads, bridges, trails and picnic shelters. They also constructed a 25-foot-tall, 150-foot-wide dam to hold back the flowing waters of several tributaries, forming a 100-acre-plus lake named Issaqueena. The valley, now swollen up to 30 feet deep, had previously been part of the sloping bottomlands of Six Mile Creek. Two decades after Issaqueena was born, a sister reservoir would join her, gobbling up tens of thousands of acres of land. Hartwell Lake was created to supply drinking water for the expanding population of the Upstate as well as provide flood-risk management, and one of its northernmost points reached all the way to the outside base of Issaqueena’s dam. Lake Issaqueena, located about seven miles northwest of Clemson, eventually became a permanent part of the University’s Experimental Forest, which currently covers 17,500 acres statewide. Relatively early in its existence, the recreation area suffered through rough times that included vandalism and neglect. During World War II, it was even used as a bombing range. To this day, shards of shrapnel are occasionally visible to sharp eyes. In its early days, Lake Issaqueena comprised much of the land that had been excessively farmed and eventually abandoned, leaving it sparsely wooded and poorly maintained. But over the decades, a forest arose and enshrouded the lake with a towering bulwark of timber. There were loblolly pines, white oaks and black cherries. There were flowering dogwoods, red maples and American ash. But perhaps even more impressive than the trees was the understory that thrived and thickened beneath the assorted canopies. Japanese honeysuckle, trumpet vine and butterfly pea wound around the timber. Mimosa and sunflower sprouted and spread. And last but not least, Jack-in-the-Pulpit, Fairy Wand and Bird’s-foot Violet added a wondrous palette of poignant color to the dominant browns and greens. South Carolina’s subtropical climate encouraged the birth of a diversity of plant species that most other areas of the United States cannot rival. An explosive menagerie matured into a botanist’s treasure trove. Lake Issaqueena became a reflecting pool, as still and perfect as a painting — but less resplendent, perhaps, than its surroundings. In the fall of 1969, a 21-year-old woman — with the uncommon first name of William — joined Clemson’s burgeoning graduate program in botany. Not yet married and then known as William Anne Barnes, she had recently earned her bachelor’s degree at the University of South Carolina and had chosen to attend Clemson to pursue her master’s. John Fairey, then a professor of botany as well as curator of the Clemson University herbarium, became William’s adviser, and she his first-ever graduate student. The pair decided that William’s master’s thesis would be a floristic study of the lands around Lake Issaqueena. And from September 1969 through December 1970, William and Fairey spent about four hours a day, three or more days a week, collecting specimens for the herbarium and cataloging everything from the most fragile of wildflowers to the stoutest of trees. The Joe Pye weed would be followed by 268 more blooming plant species and 443 overall species. All told, William and Fairey would collect more than 1,100 specimens. 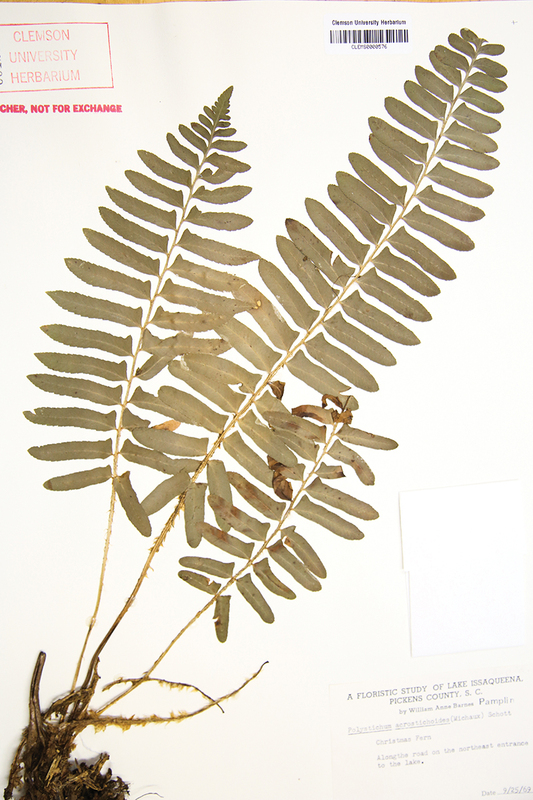 And many of them remain in Clemson’s herbarium to this day, carefully pressed, preserved and catalogued. Though now more than 45 years old, they look as if they might still be alive. It didn’t take long for William to fall in love with Issaqueena. She reveled in the fresh, oxygen-engorged air. She roamed the labyrinth of trails like a daring explorer. Her first autumn in the woods unveiled a conglomeration of plants and trees whose scope was almost beyond her comprehension. She especially treasured her time spent in lush, moist coves, where she stood beneath pines, sugar maples and white ash and knelt to study ginseng, violets and trillium. It was often hard work, but that made it no less magical. 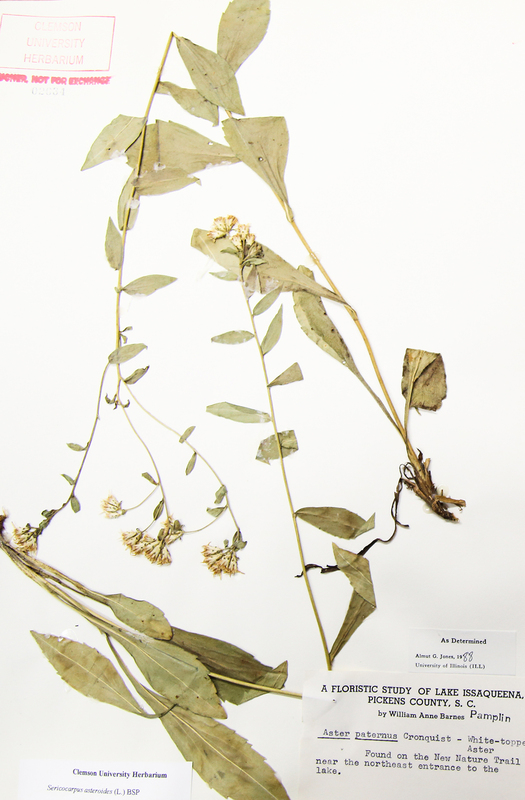 The discoveries mounted, both figuratively and literally, much to the herbarium’s benefit. To press the plants, the folded sections of newspaper were stacked on top of each other and placed between the wooden slats of the press, which consisted of two outer boards that could be squeezed together with straps. The tighter, the better. The press was then placed over heat for several days to dry out the plants. Once dry and correctly identified, the plants were turned over to the herbarium crew, which made certain that each specimen was glued on special paper for display and storage. A label that included the information William had written on the newspaper was attached to the edge of the display paper. Finally, these were stored in large manila folders in cabinets in the herbarium. This part of the research was time-consuming and tedious, but it paid off in the end by preserving the specimens. Whether sweating in the heat, shivering in the cold, or being soaked by rain, the intrepid pair continued to toil. Once William started a job, she was the type who was driven to finish it. That way, there would be no regrets. William saw plenty of snakes and wild animals, but never deer or bear. She also never saw a beaver, but she did see a slew of chewed-off tree stumps, as well as a couple of the tireless creature’s dams clogging up the numerous creeks that gurgled toward the lake. And not everything that William witnessed was a natural part of the forest. Several times, her sharp eyes seized on shards of shrapnel leftover from the WWII bombs. 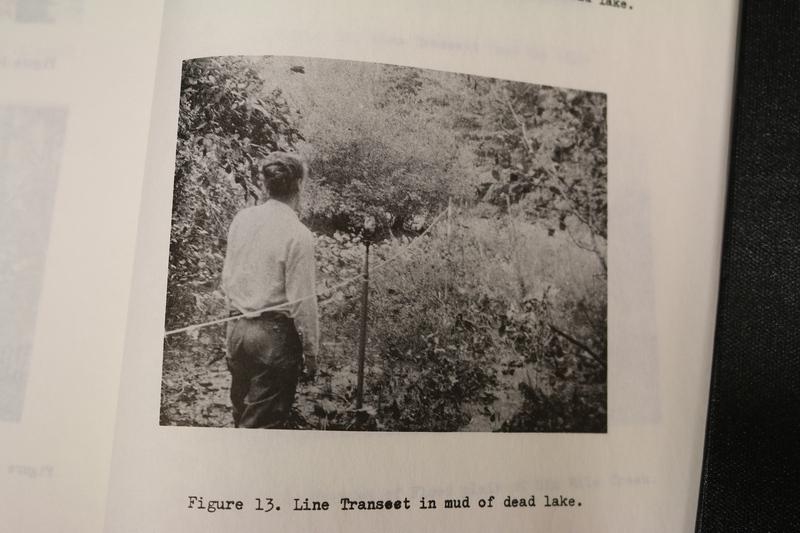 The crowning glory of William’s research was a “line transect” that ran from the road to the water’s edge. A line transect is a tape or string laid along the ground in a straight line between two poles. Botanists use these lines to illustrate a linear pattern along which communities of plants intermingle and change. Fairey brought a chunk of metal he had salvaged from a piece of old farm equipment and pounded it deep into the ground next to the road. Then he and William tied the 214-meter-long line to the pole and manually extended it across a dead lagoon, flood plains and aquatic meadows before finally reaching the water’s edge. During certain portions, they had to wriggle between thick tangles of brush, or crawl on hands and knees through mud as sticky as glue. In her thesis, which was published by Clemson in 1971, William went into exquisite detail about everything she had discovered growing within one meter of the line. There were hardwoods, floating-leaved species, moss, alder, river birch, silky willow, and grasses and herbs — dozens upon dozens of plant varieties all carefully documented by species and location. It was a grand and scientifically valuable mapping of the forest’s splendorous biodiversity. In 1970, during the height of her research, William Anne Barnes got married and became William Barnes Pamplin. She completed her master’s at Clemson in 1971 and then became a life science teacher at Easley Junior High for a few years. In 1975, she gave birth to her first child, a daughter, and then later to a son. While her kids were young, she chose to become a full-time mom. In the summer of 1977, William received a call from Fairey saying that he wanted to publish a shortened version of their research in the form of a booklet that could be carried in the field. The booklet was titled “A Floristic Study of the Shores of Lake Issaqueena, Department of Forestry Technical Paper No. 9.” It was published and distributed in October 1977. “My mother-in-law babysat for me so that I could come back to work with John Fairey and finish the booklet, which completed our first goal — helping the Clemson University community,” William said. William returned to teaching — this time at Easley High — in 1982. And she spent the next 20-plus years enriching the minds of hundreds of biology students before retiring in 2003. During this period, William and her family returned to Lake Issaqueena for hikes and picnics just a handful of times. As life’s myriad demands took hold, her experiences with John Fairey faded into distant memory. John E. Fairey, who mentored countless students of field botany and taxonomy during more than 30 years as a Clemson University professor and research scientist, died on Feb. 1, 2015, in Columbia, South Carolina. He was 74. Fairey, who mentored William Pamplin during their collaborative research at Lake Issaqueena, was curator of the Clemson University Herbarium from 1968-77 and played a critical role in maintaining the herbarium and preserving its contents. Fairey joined Clemson University in 1969 and retired in 2001. William and her husband debated what to name their daughter. They finally settled on Ryerson, which was William’s grandfather’s and sister’s middle name. 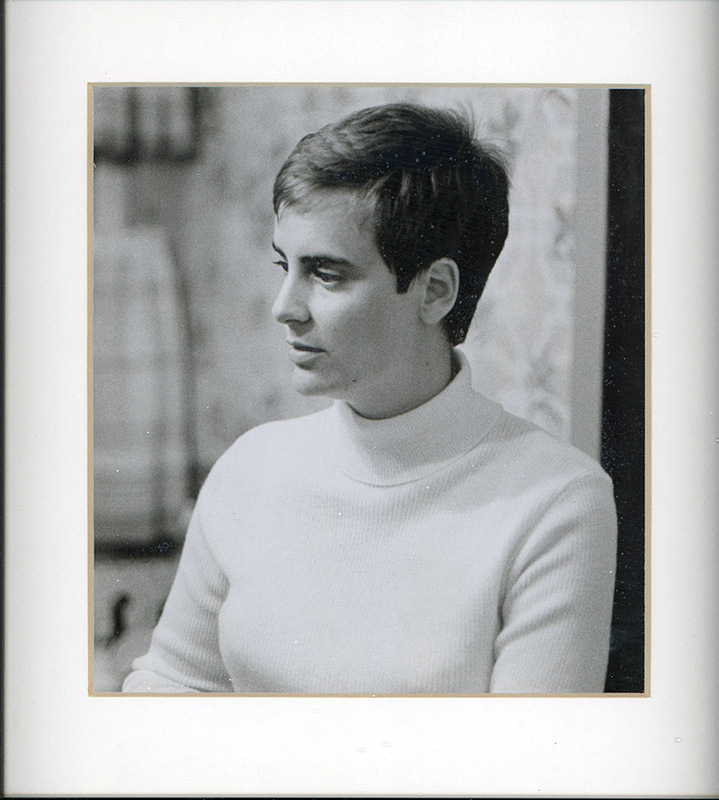 Ryerson grew up to look remarkably like her mom. In fact, if you were to examine photographs of both women when they were in their 20s, you might not be able to tell them apart. In addition to their appearance, William and Ryerson had another thing in common: an unusual first name. But Ryerson’s friends found a simple way around that. They called her Rye. Rye Pamplin loved just about everything the outdoors had to offer. She grew up in Easley and attended Easley High during the same time that her mom was a teacher there. This had its plusses and minuses. William often knew Rye’s grades before she did. Though Rye loved science and biology, she ended up pursuing a career in law enforcement, earning a bachelor of science in criminal justice at the University of South Carolina Upstate in Spartanburg. After graduation, she became a police officer for a short while and then a forensic crime-scene investigator. Rye soon discovered that she was hyper-sensitive to the chemicals used by forensic officers. Too much exposure made her violently ill. “After a couple of jobs in the field, I had to quit and find a Plan B,” Rye said. Plan B turned out to be a return to her outdoorsy roots. Now in her mid-30s, Rye would replace chemicals with fresh air, fingerprints with paw prints, blood with soil. In 2010, she was accepted into the graduate program in Clemson’s department of forest resources. 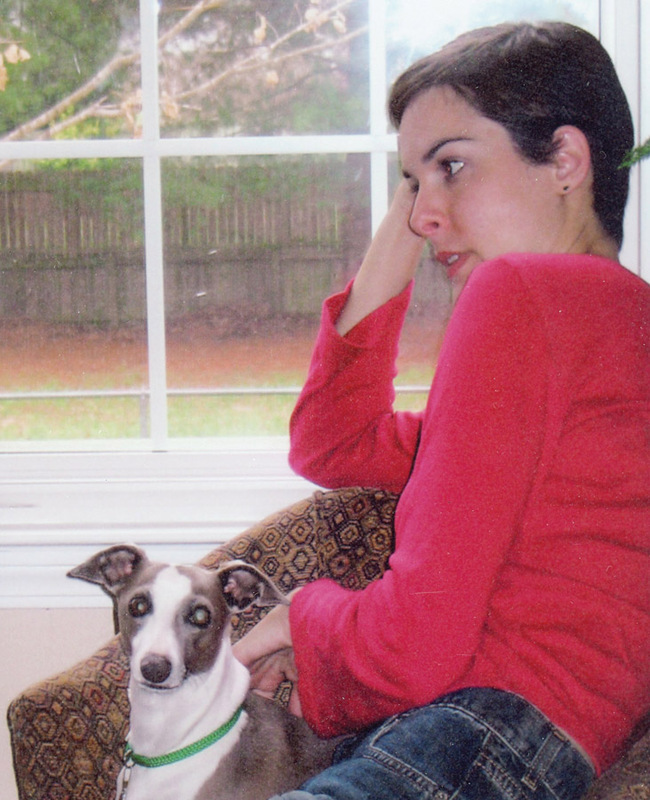 In late summer of 2011, the revelation that would lead to Rye’s master’s thesis — and the eventual 2016 publication of a research paper titled “Multitemporal phenological floristic analysis of the shores of Lake Issaqueena, South Carolina” — convinced Rye that this time she had made the right decision. When she told her mom that she would be following in her footsteps, the entire family celebrated. William even admitted afterward that she had been silently hoping this might happen all along. Though their research would be nearly identical in many ways, there were some dissimilarities. More than 40 years had passed since William had studied and collected specimens in the forests near the lake. Not only were the trees, plants and flowers different — either in variety or maturity — but the methods used by botanists to study plants had become more structured, complex and spatially oriented. 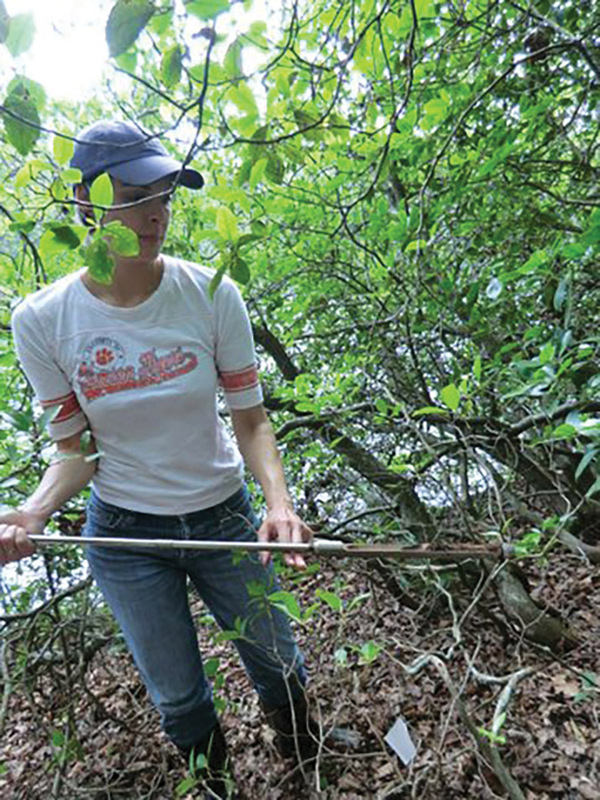 With the expert guidance of Mikhailova and additional assistance from Clemson advisers Patrick McMillan, Christopher Post and Julia Sharp, Rye was taught how to use a natural community sampling method called the Carolina Vegetative Survey. While William basically walked around a large research area and noted what she found, Rye mapped out more than two dozen 20-by-50 meter plots and focused her research on them. Rye used a GPS-enabled camera to record blooming plants, and her photographs were meticulously labeled and then stored on a Google website developed by Mikhailova. The photos still exist on this site and are frequently accessed and examined by Rye’s successors at Clemson. However, no matter how sophisticated the techniques, field research always involves plenty of legwork. Determining, measuring and marking the plots was tiresome in and of itself, much less studying and cataloging their contents. It took Rye from the fall of 2011 until the end of 2012 to finish her on-site studies. During her long hours spent in the forest, Rye would occasionally feel a sudden urge to halt in her tracks and examine her surroundings — not as a scientist but as a lover of nature. She would stand beneath the trees and take a series of deep breaths, her mind and body growing exceptionally peaceful. Though Rye spent most of her time in the forest, she also endured many evenings huddled in her office or at the herbarium. In retrospect, Rye had only one regret about her time spent at Lake Issaqueena. In reinvestigating her mom’s research, Rye had hoped to also replicate — in the exact location — the line transect that William and John Fairey had worked so hard to establish and complete. Amazingly, she and Knight Cox were able to find the piece of metal farm equipment that Fairey had pounded into the ground back in 1970. And using fiberglass tape, Rye restrung the line. But when she returned the next day to begin recording the plant species that now grew there, she sank to her knees in disbelief. Overnight, a host of feral hogs had ravaged the entire area. Despite this setback, Rye finished her thesis and received her master’s from Clemson in 2013. In the end, she had identified 203 blooming plants as compared to William’s 269. This could be attributed to Rye’s smaller research area as compared to her mom’s. There were 149 common plant species blooming in both study periods, indicating that some were new and some were not found. The majority of plants bloomed earlier and longer in 2011-12 than in 1969-70. But it was unclear whether this was due to climactic variations, environmental changes or the differences in their data collection methods. Overall, Rye documented 208 species and hundreds and hundreds of specimens. For a variety of reasons, both natural and otherwise, plant species come and go. Some are driven into extinction by human intervention, never to be seen again. But both William’s and Rye’s projects resulted in comprehensive lists of flora that future scientists at Clemson can refer to when conducting their own research about the health and well-being of our plant communities. This, more than anything else, is their most valuable scientific legacy. And it’s a legacy that will stand the test of time. After leaving Clemson, Rye moved across the country and went on to work as a botanical biological science technician in New Mexico and California. However, she has recently returned closer to her roots, settling in Asheville, North Carolina, to be nearer to her mom and dad, who still live in Easley. Rye’s experiences at Lake Issaqueena remain fresh in her memory. When it comes to career choices, children sometimes follow in their parents’ footsteps. But how unusual is it for a daughter to conduct scientific research that is nearly identical to her own mother’s previous body of work? No one keeps statistics on things like this. But three people who mentored Ryerson Pamplin during her time at Clemson University said that her retracing of William Pamplin’s research was unique, as far as they knew. Dixie Damrel, curator of the Clemson University Herbarium since 2008, worked closely with Ryerson in 2011-12, and also has intimate knowledge of the specimens collected by William in 1969-70. Patrick McMillan, who was curator of the herbarium from 2001-08 and is now director of the South Carolina Botanical Garden, said that his son Nic is a graduate student in the department of forestry and environmental conservation. Elena Mikhailova, associate professor of soil science in the department of forestry and environmental conservation, was Ryerson’s major advisor throughout her project. Mikhailova helped Ryerson identify, develop, organize and conduct her research. In late January this year, William and Rye returned to their roots. At the herbarium, they were enthusiastically greeted by Dixie Damrel, who apparently harbored no ill feelings over how hard Rye had once made her work. Nor did William. Her specimens in the herbarium remain in mint condition. Rye’s photographs are on colorful display on Clemson’s special website. But her physical specimens have not yet been as carefully preserved as her mom’s. Instead, they are packed in several airtight cases, still waiting to be pressed and labeled. At Lake Issaqueena, they meandered on some of the same trails they had explored during their research. Arm in arm, mother and daughter stood near the water’s edge and admired the beauty of the lake. Later, they knelt to examine wildflowers. The adventurous pair — still so alike in appearance despite their difference in age — strode down a broken stone path to a wooden platform that provides a clear view of the Issaqueena Dam. With the sound of rushing water in the background, they began to talk. Learn more about the Clemson Experimental Forest. Access maps of the Clemson Experimental Forest. —During the reporting and writing of this story, Jim Melvin was a media specialist for Clemson’s Public Service and Agriculture and College of Agriculture, Forestry and Life Sciences. He has since become the director of public information and marketing for the College of Science.